I’m starting to feel a little lonely typing away all day. I’ve been working for almost two months on my first draft of my first novel. Today the words flowed well. So well in fact that I’ve had time to do a little self-indulgent web-browsing. No I wasn’t on a dating site. I’ve got the right man thing all sorted already. I’ve been looking at potential pets. As child I was constantly surrounded by cats, dogs and birds (until I started to open cages enabling their freedom). As an adult I’ve always travelled too much every year to keep a demanding pet. Unfortunately they’re also the type that nuzzle you and make you seem like less of a loon for having a one way conversation with them. I have managed to look after a fish. Sadly my Siamese fighting fish of two years passed away just before Christmas. No other fighting fish looks as kooky and intelligent, so there’s no new pet fish. Two years is terrible time period anyway. Long enough to form an attachment, short enough not to be able to countenance the idea of another fishy friend dying on you in two years’ time. Now I’m home most of the time writing. It’s wonderful. It’s just really quiet. I’m concerned that my collection of stuffed Tiggers in various sizes (which I’m trying to preserve for my child’s nursery, if I ever get around to that) is going to be pulled out of storage and dotted around the study to give the effect of company. I want a pet. I need a pet. Many writers have cats. Mark Twain loved them. He affectionately named one Satan. I’m not kidding. 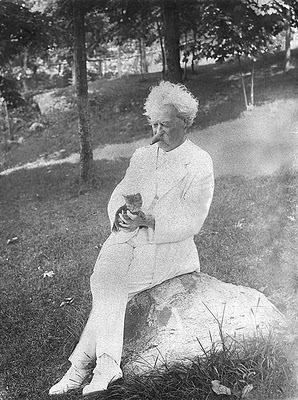 2010 marks the 175th anniversary of Twain’s birth and the 100th anniversary of his death. Maybe I should get a cat? My partner Connor hates cats. He loves Dumas though. I discovered today that author of Count of Monte Cristo fame loved cats. Would he reconsider on that basis? It’s pointless anyway. I’m asthmatic so I can’t have furry pets inside the house permanently. We don’t have a backyard here, so we can’t get a dog. I’m not big on birds in cages, even though I love the graceful brass curves of the antique variety. We’ve got a balcony. A rabbit hutch would fit on it with room to spare. Would a rabbit make a good companion? I’ve changed my desktop background to a fluffy ginger rabbit. I wonder if Connor would agree to a rabbit? I hope I’m not allergic to them.